This is one of the most common mistakes new vacationers coming to the area experience. They’re so excited about scheduling a long overdue beach vacation that they book a condo that’s way bigger than what they really need. If you’re not finding the size condo you want where you’re looking, try a different company. Come to Grand Strand Resorts and take a look at the wide assortment of condos that we have. We have a full inventory of North Myrtle Beach 1BR condo rentals as well as two and three bedroom units. You won’t have to settle for something more than you really need because, in the end, it’s your money. Don’t waste it on a company that can’t give you what you want at the price you’re willing to pay. With Valentine’s Day approaching these North Myrtle Beach 1BR condo rentals are perfect for a get away weekend for the two of you. Reserve a place that comes with a swimming pool, hot tub, and Jacuzzi and you’ll be all set with plenty of water sports to enjoy before you ever get to the oceanfront! If you’re looking for something different to do for the holiday why not make it a Valentine’s Day to remember in the Tunnel of Love at Ripley’s Aquarium. Picture an evening featuring a four-course dinner in an unbelievable setting, a drink and a romantic flower for $79.99/couple. Or upgrade the Tunnel of Love package to include a box of chocolates and a strolling musician. The Tunnel of Love package is $89.99/couple. 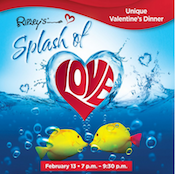 The Tunnel of Love will be held from 7-9:30 p.m. Thursday, February 13 at Ripley’s Aquarium. The 85,000 square foot Ripley’s Aquarium is located at Broadway at the Beach and features many exhibits with a moving walkway to guide you through.